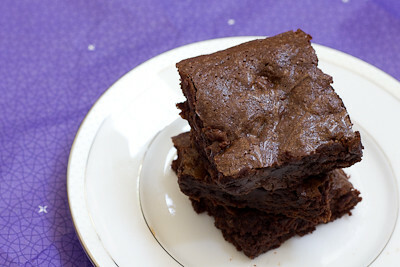 This week's Tuesdays with Dorie (TWD) recipe was chosen by Anne of Anne Strawberry: Classic Brownies. There's really no explanation needed for these - they're just your traditional brownies, no bells or whistles. These brownies were extremely easy to make. Simply melt some butter and chocolate, add the sugar, eggs, vanilla, and then some flour. Instead of nuts, I added chocolate chips to the mix. 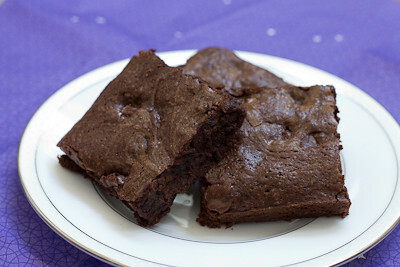 These baked up perfectly and were slighty cakey but mostly fudgey and very chocolately. Thanks Anne, for hosting this week. I'll definitely be making these again. If you would like the recipe, you can find it here. Make sure you check out the TWD Blogroll, to see how everyone else enjoyed these chocolately treats! - I used semisweet chocolate chips instead of chopped bittersweet chocolate. - I used a 9-inch pan instead of an 8-inch pan and the brownies were done baking in 20 minutes. 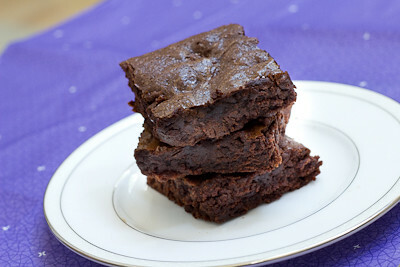 Wow, those pictures sure put me in the mood for brownies! Sometimes classic is best! Looks like the perfect brownie! Yum!! i'll tell you why a boxed mix is still in the running--it's dirt cheap! regardless of that, these are clearly superior. nice descriptions and photos, jaime!